Behind the building I live there is a big jungle with tall trees. I admire these trees a lot. Probably the reason why I noticed this light post is because it stood alone amongst these giant trees. First I was interested only in capturing the light post so I zoomed in to qlik it. But the picture didn’t look all that great. I was so confused that why something which is so soothing to eyes in reality is not looking appealing in the photograph. But soon I realized that the complete scene, the light post with its background, would make an attractive picture. So, to control the depth of the field I have qlikd the picture in the Aperture Priority mode in the neutral lights. As the picture is qlikd in the night without the flash lights, the Auto Contrast option in photoshop is used to increase its tonal quality. To enhance the look of the background, Lighting Effects option is used selecting the style to ‘Flashlight’. The light type used is ‘Omni’ and the Intensity is set at 46 for light yellow color (RGB: 252/249/233). This focus gives the trunks and stems of the trees a shiny bright white color. Under properties a darker shade of yellow is selected at (RGB: 255/254/199), Gloss at -100(Matte), Material at -100(Plastic), Exposure at 0 and Ambience at -25. 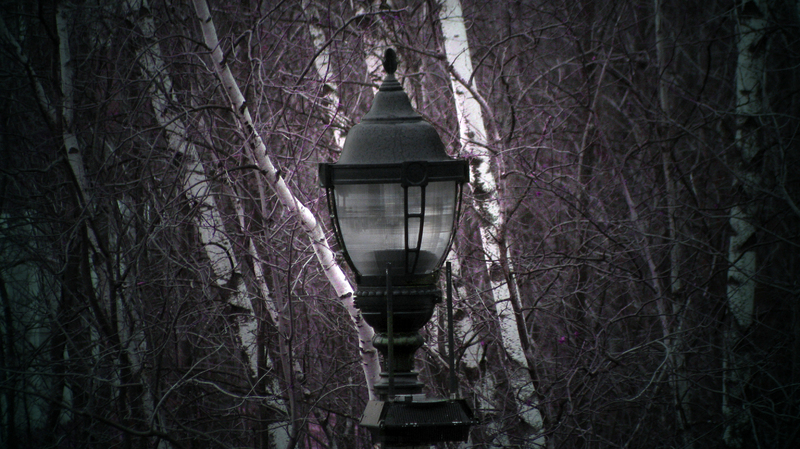 Though the picture is colored it still appeared B&W because the trees are dry and the light post is black. This could possibly be the best situation to play around with some colors. I used Hue/Saturation option at -75/30/0 to gives a nice blend of purple and cyan in the background. These colors can be set in the Lighting Effects option also (where I used shades of yellow) but I prefer using hue and saturation because it displays wide range of contrasting colors together in no time making selection easier. As I wanted to retain the original look of the light post I used the History Brush Tool.